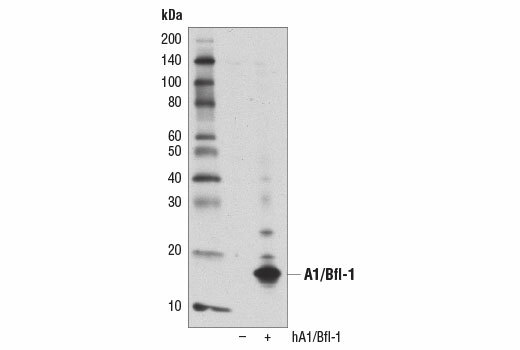 A1/Bfl-1 (D1A1C) Rabbit mAb recognizes endogenous levels of total A1/Bfl-1 protein. Proteins of unknown origin are detected at 50 and 130 kDa in some cell lines. Monoclonal antibody is produced by immunizing animals with a synthetic peptide corresponding to residues surrounding Gly29 of human A1/Bfl-1 protein. 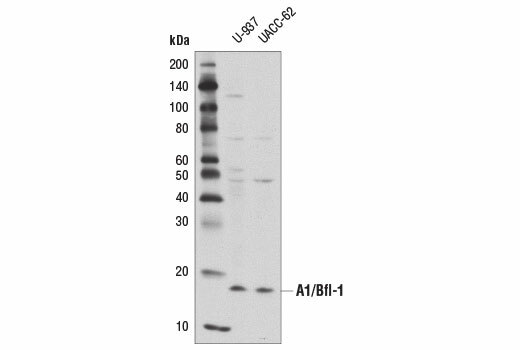 The Bcl-2-related protein A1 (Bfl-1, BCL2A1) is an anti-apoptotic member of the Bcl-2 family originally cloned from mouse bone marrow as a granulocyte macrophage-colony stimulating factor (GM-CSF)-inducible gene (1). Expression of A1/Bfl-1 is primarily restricted to hematopoietic cells, although it has been detected in some non-hematopoietic tissues including lung and in endothelial cells (1,2). A1/Bfl-1 protein is rapidly induced by NF-κB and is elevated in response to a variety of factors that stimulate this pathway, including TNF-α and IL-1β, CD40, phorbol ester, and LPS (2-4). As with other Bcl-2 family proteins, A1/Bfl-1 functions by binding and antagonizing pro-apoptotic members of the family (Bid, Bim), which inhibits release of mitochondrial cytochrome c (5). In contrast, research studies indicate that the enzyme calpain cleaves A1/Bfl-1 at specific sites within the amino terminal region, creating pro-apoptotic, carboxy-terminal fragments that promote mitochondrial release of cytochrome c and apoptosis (6). Studies suggest a possible therapeutic strategy of targeting apoptosis through use of the specific A1/Bfl-1 cleavage fragments (7). Lin, E.Y. et al. (1993) J Immunol 151, 1979-88. Karsan, A. et al. (1996) Blood 87, 3089-96. Lee, H.H. et al. (1999) Proc Natl Acad Sci USA 96, 9136-41. Zong, W.X. et al. (1999) Genes Dev 13, 382-7. Werner, A.B. et al. (2002) J Biol Chem 277, 22781-8. Kucharczak, J.F. et al. (2005) Cell Death Differ 12, 1225-39. Valero, J.G. et al. (2012) PLoS One 7, e38620.